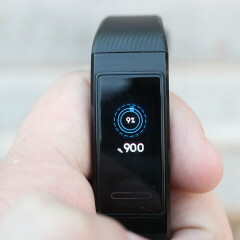 When Huawei sent me the Mate 20 and Mate 20 Pro to review, it sent along a couple of fitness bands as well. I've been using the Band 3 Pro for a few weeks now, and one thing that I never bothered to check was the price, until recently. I was blown away to find that this device only costs $69.99. The thing is that it checks most of the right boxes for what I'd want in a wearable. 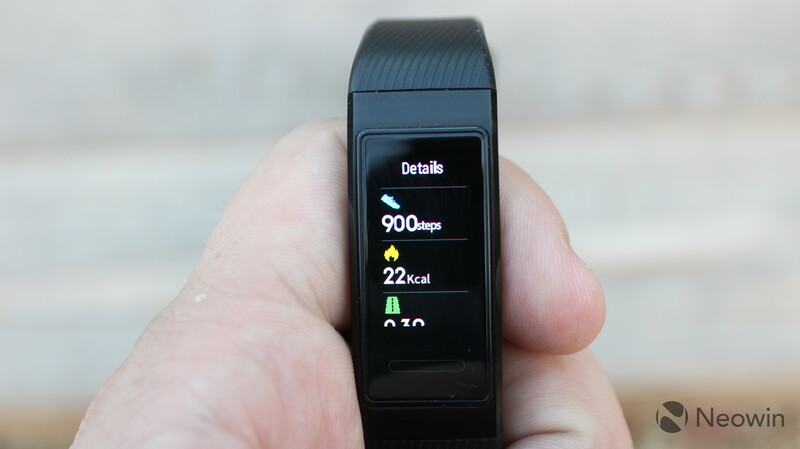 It tracks fitness, and it delivers notifications onto an OLED display. 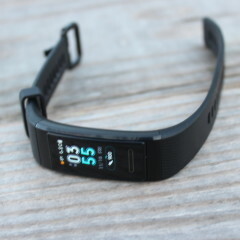 It offers more advanced features too, such as sleep tracking and continuous heart rate tracking. Note that I'm referring to sleep tracking as a more advanced feature only because so many smartwatches - which can cost 10 times as much - don't do it. It's also an elegantly simple and minimal device. It's discrete and it's comfortable to wear. I actually like it a lot. 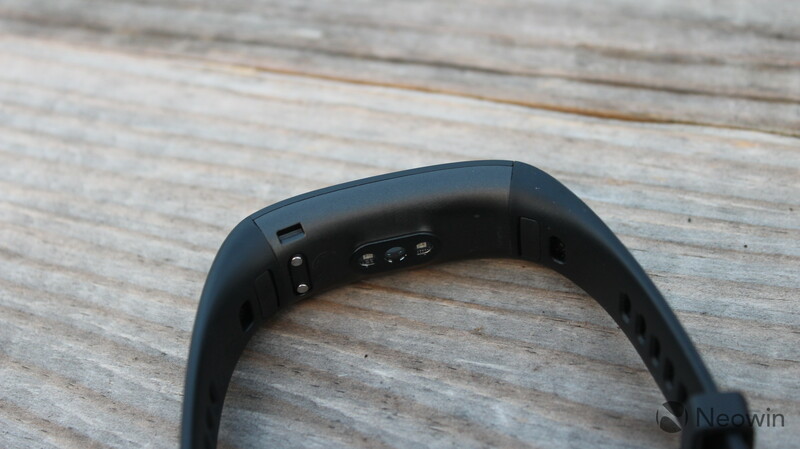 As I mentioned earlier, the Huawei Band 3 Pro is simple and minimalistic. In fact, it doesn't even have any buttons on it. To power it down, you have to go through settings on the watch, and you have to put it on its charger to turn it on. 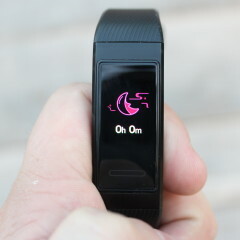 Other than that, the design is pretty typical for a fitness band. It has a metal body with a rectangular screen, which is vertical in line with the strap. 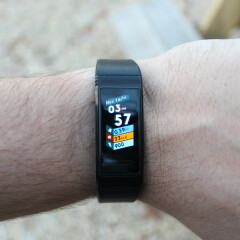 Underneath it, you'll find the heart rate sensor, along with two pins for charging. I really don't like using pins for charging. It's my experience that these connectors get dirty over time, and they're hard to clean. A better solution is wireless charging. The charging cradle is also a bit of a pain to clip onto the device. 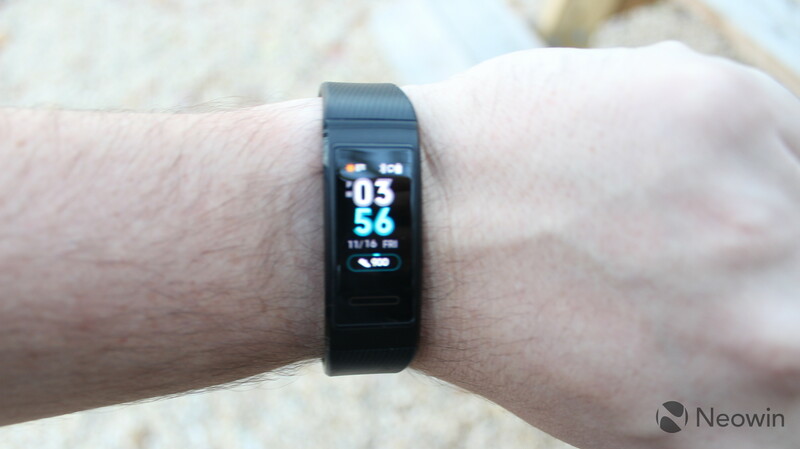 As you can see from the image above, there are clips on the sides, and the cradle over fits over a portion of the heart rate sensor. The good news is that you really don't have to charge it much, as you'll get anywhere between four days and a week of battery life. 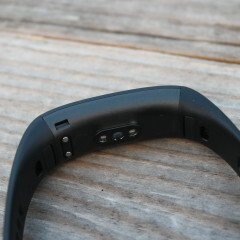 The strap is made out of silicon rubber, with the longer end being 120mm and the other being 92mm. It clips together like a standard watch clasp. It uses a 120 x 240 AMOLED display, which is actually quite nice, with vibrant colors. 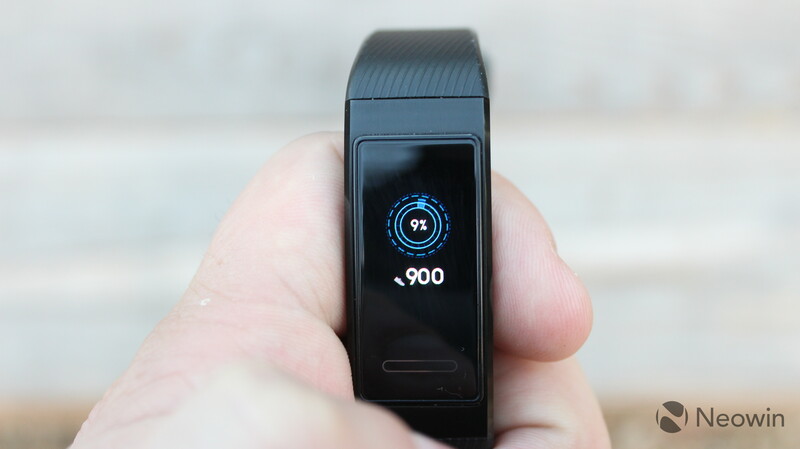 It's actually better than what you'll find on a lot of other fitness bands, which often use P-OLED screens of lower quality. 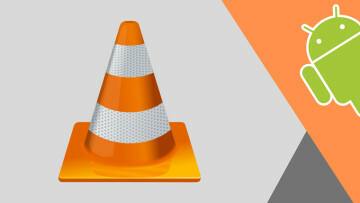 There's definitely some pixelation that you can see on the screen, but that's fine, considering that you're really not going to be using it for anything big like viewing photos or something. And that's about it. What you see from the images is what you get. There are no hidden ports or buttons. It's pretty simple. As I said, there are no actual buttons, but there is a capacitive home button below the display. This makes for an incredibly simple approach to navigation. When you raise the Band and it wakes up, you'll see the date, time, your steps, the temperature (in Celsius, which sadly can't be changed), and a battery indicator. 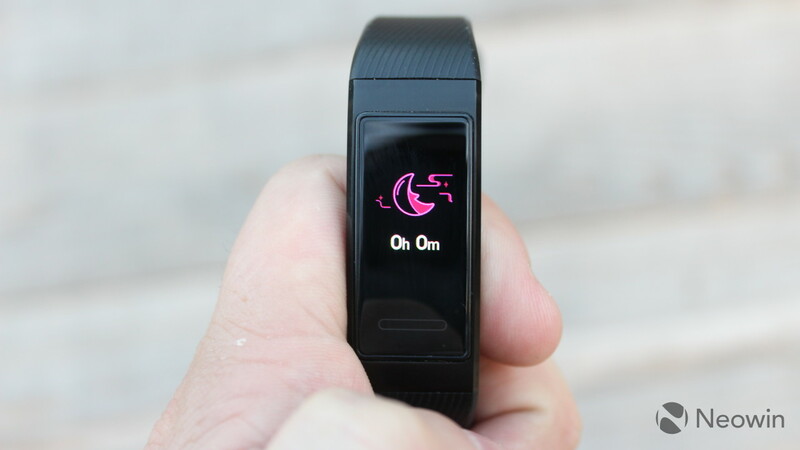 Swiping up or down from there will take you to different sections for sleep tracking, messages, workouts, heart rate, and the step counter. Some of them don't actually do anything if you try to open them. For example, if you scroll to sleep tracking, you'll see how much you slept last night, and there's no additional data. I appreciate that Huawei included sleep tracking, as it's a feature that many watches don't have, and it can actually be useful. For the most part, though, I prefer not to use it. With previous devices, I've found that knowing how much sleep I got would actually affect how I feel during the day. For example, if I only get two hours of sleep, I'll probably be fine for a day, but if I know exactly how much I didn't sleep, I'll feel tired. I did test the feature, and it works well. 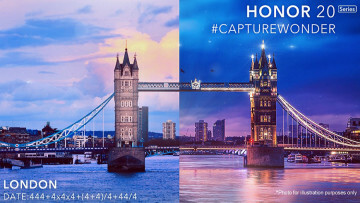 While there's no additional data on the watch itself, you'll be able to get more in-depth information through the Huawei Health app. This was a smart implementation, because for the same reason I noted above, you might not want to see all of your sleep data at once. Now, you can see how much you slept and pick up your phone for more in-depth information if you want to. You can also get notifications on the Band 3 Pro. The implementation of this is a bit messy, but it's good that it's there. 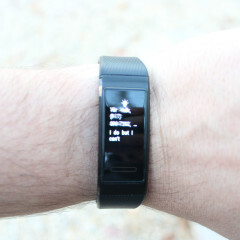 The ability to receive notifications is probably the one feature I really want on any wearable. 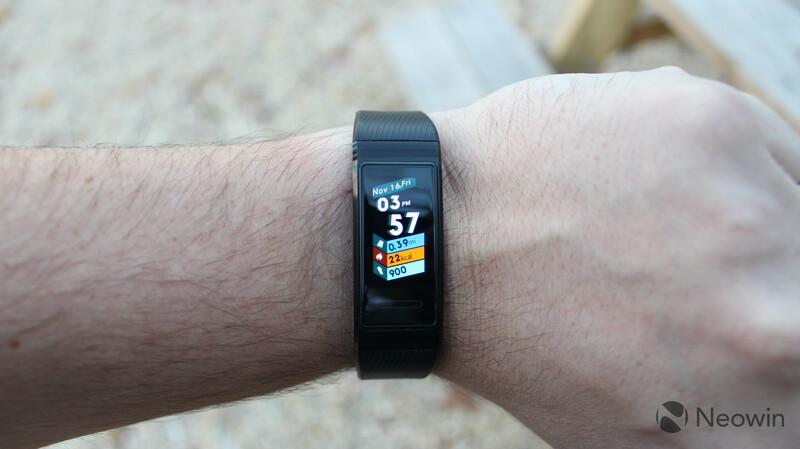 When setting up the Band 3 Pro, you'll be able to choose which apps can show notifications on your watch, which is great, as I don't need to be alerted when OneDrive is syncing, something that I always hated about the Microsoft Band. It's loaded with quirks though. For one thing, you can only get notifications that appear on your phone, so you can't have notifications blocked from an app on your phone and not on the Band 3 Pro. It also doesn't sync with your do not disturb preferences. If you put your phone on do not disturb and go to sleep with the Band on, you'll probably be woken up to your wrist vibrating. 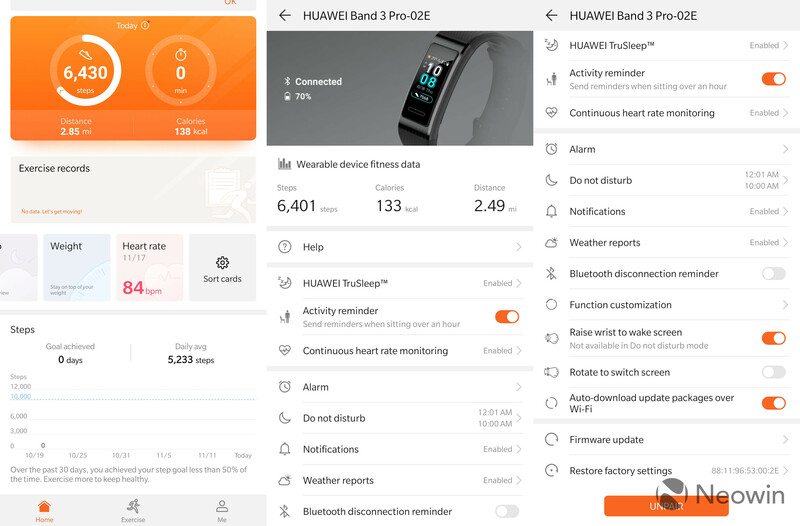 And you can't set the Band 3 Pro to do not disturb from the actual device; you need to do it through the Huawei Health app. My biggest problem, though, is that the notifications just pile up. I allow messaging apps to send the Band 3 Pro notifications. Unless you scroll down on the watch and select "clear all", it will always say that you have 10 notifications. In other words, it works independent of your phone in this way. 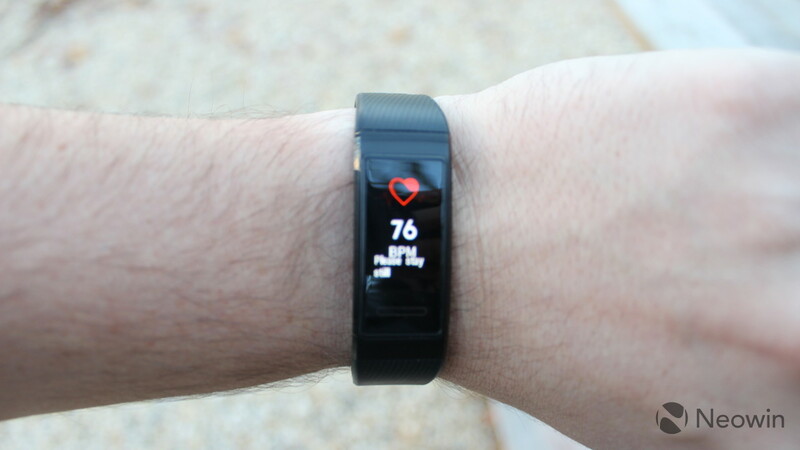 The heart rate section does exactly what it sounds like, and you can set it to continuously record your heart rate. Through the Health app, you can make it send you an alert if your heart rate gets too high. The app says that this setting uses more battery life, although I haven't noticed a real impact. 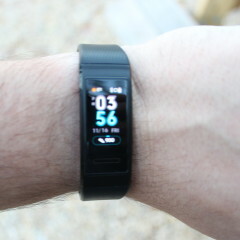 And then, of course, there's the actual fitness tracking. 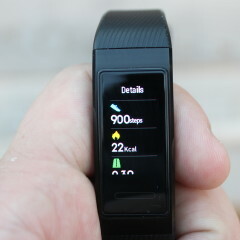 This will tell you your steps and how close you are to your goal, and you can tap it for more information. There's also a "More" section, which is a combination of more options and settings. You can use this to change the watch face (there are only two), find your phone by sending an alert, set a timer, use the smartwatch, adjust brightness, reset the device, restart the device, or power it down. 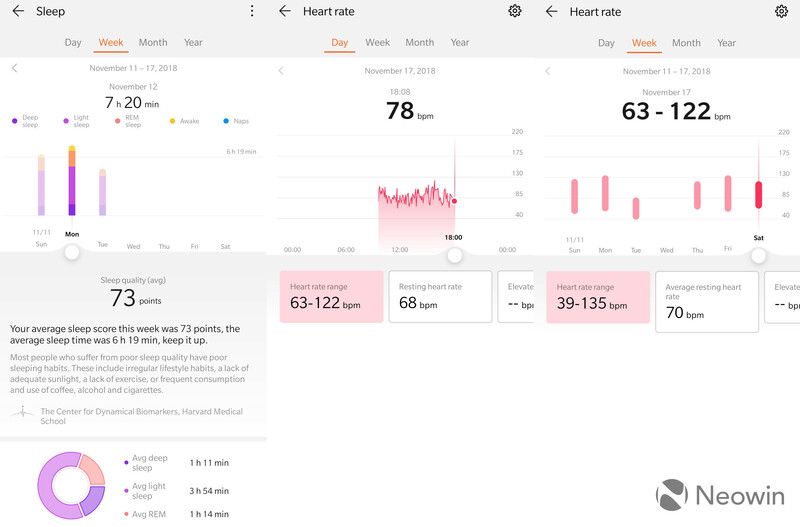 As is often the case with simpler designs for wearables, a lot of the interaction can be done through its companion app, which is Huawei Health in this case. The app is available for both Android and iOS, so you can use the Band 3 Pro with your platform of choice. 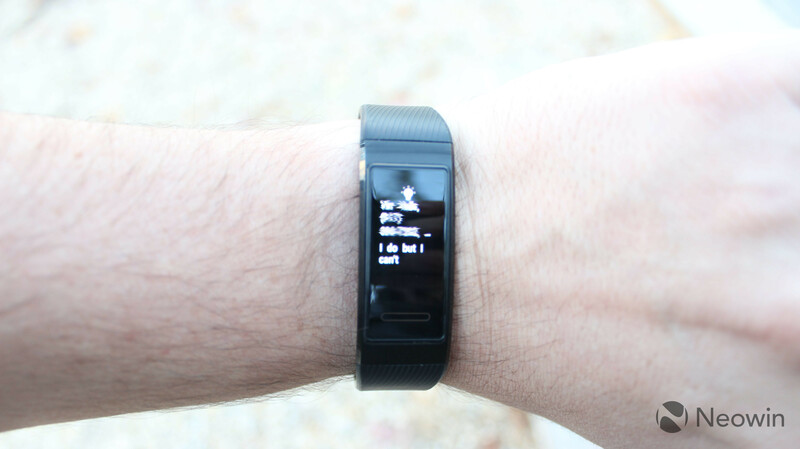 Upon launching the app, you'll see a dashboard that tells you your steps, sleep, heart rate, and so on. 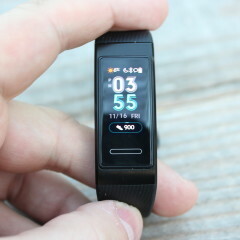 At the top-right corner, you'll see a logo for the Band 3 Pro, and that's where you'll go to adjust the settings on the device. For example, this is how you can turn on do not disturb, or you can set it to automatically turn on and off at certain times. This is also where you can customize your notification settings, turn on or off sleep tracking (which is automatic when it's on), and you can even customize the order of the menu on the watch or remove items. As I mentioned earlier, you can use the app to get more in-depth analyses of your data. Rather than just seeing how much you slept, you can see how much of it is light sleep, deep sleep, and REM sleep. 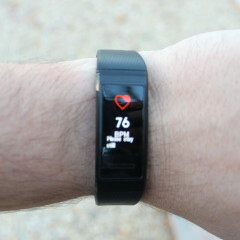 You can also get a heart rate range if you have constant heart rate monitoring on. And of course, you can see your steps in daily, weekly, or monthly views. As you can see from the screenshot on the left, it breaks it down by every half hour. You can actually drag that little white dot across the graph to see different times. 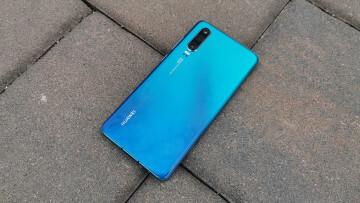 Huawei's Band 3 Pro is actually a pretty great device, and if you're considering a wearable, the combination of the price and the feature set might be enough to sway you. It has the fundamentals and more. 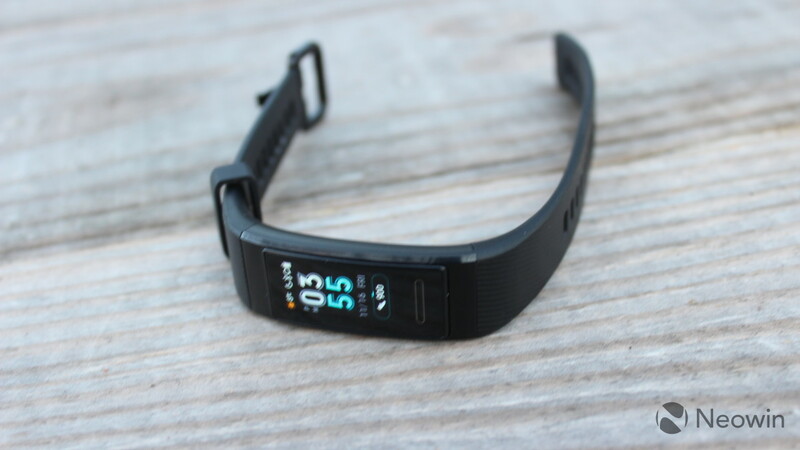 It can do continuous heart rate tracking, sleep tracking, step counting, and it will show you notifications. My biggest issue with it is that the notification system is just messy. You have to set do not disturb through the app, and you have to manually clear out your notifications. The other thing I take issue with is the pin charging, but that's not a big deal. Ultimately, it's a really great device. 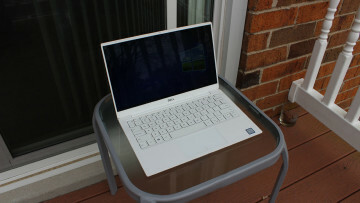 It's stylish, while not being big and bulky. It's something that's comfortable to wear, and it doesn't stick out like some of the massive smartwatches that we're seeing these days. If you've never owned a wearable device before, you probably don't want to spend hundreds of dollars on a smartwatch. 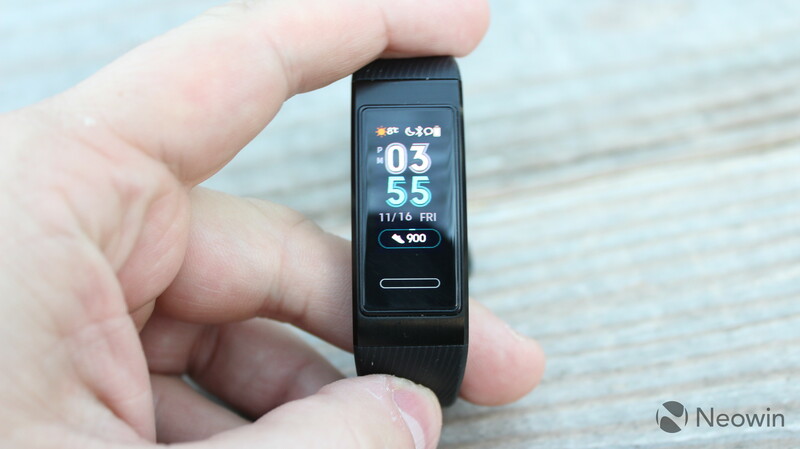 For $69.99, you really can't go wrong with the Huawei Band 3 Pro. If you want to check it out on Amazon, you can find it here.